Sweet and tangy organic dried apricots. Dried naturally in the sun rather than using chemicals, they’re magnificently dark and rich in flavour. Use to add some robust sweetness to curries or tagines, or snack straight out of the bag. Try using them in traditional Asian and African dishes, like a butternut squash tagine, or some carrot and toasted nut tabbouleh. Dried fruits are best kept somewhere cool and dry. Once you’ve opened the pack, put your dried fruit into a sealed, airtight container. If you want it to last even longer, dried fruit is perfectly happy in the freezer. Just put the fruit in a sealed freezer bag first. 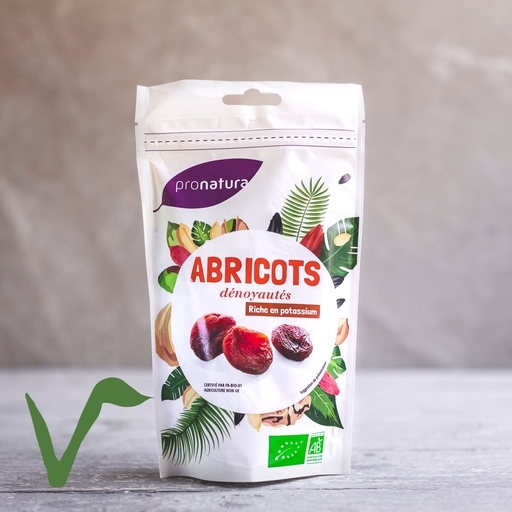 For over 30 years, ProNatura have been coordinating production and providing support for small-scale organic farmers – initially in their native France, and now further afield in Morocco, Togo, Burkina Faso and more (where the growers are also Fairtrade). They offer all sorts of expert advice and resources: from practical and financial support in becoming organically certified, and help promoting soil fertility and choosing the best varieties to grow in each region, to assistance in storing and packaging the final results. Their fresh fruit has been such a smash hit at Riverford that Guy even went out to Togo to meet ProNatura’s organic, Fairtrade pineapple growers for himself – see more in this video. Prepared in a kitchen where eggs, gluten, milk, nuts and sulpher dioxide are also handled.